It seems a bit grim outside today. Well this was not the flying start I had envisaged! Yesterday it was cold, but sunny and clear with a 12knot wind when we were dropped off. We could have travelled but unacclimatised to the cold and altitude we thought it prudent to spend the night here. 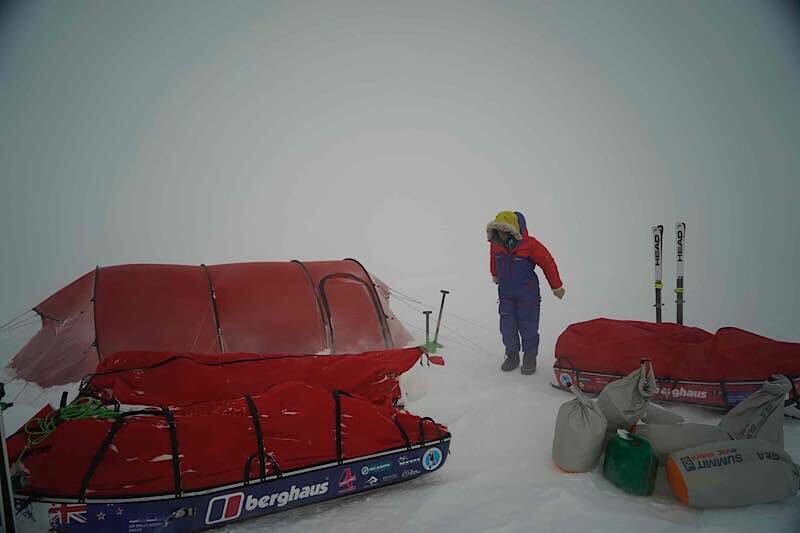 Overnight the wind picked up considerably and visibility has dropped dramatically. It’s pretty stormy outside right now and moving does not seem like an option. We need at least reasonable visibility to travel as we really must keep a visual on one another all of the time as we mustn’t get separated out here. Ideally we’d also have our first couple of kite sessions in gentle, friendly wind to get used to the giant loads and this hard, bumpy surface. So we’re tent bound in a storm and it’s really very unpleasant outside! The thing which is causing us our main concern it the wind direction. For 3 years I have been studying wind models and at this location the wind almost always comes from the south. This is important as it means we can travel either north along 132’ latitude to get to the Spectre but also crucially it means on the way back we can travel east towards Theil Mountains and back to Union Glacier. Last week when we looked at wind models it appeared the wind was coming from the NE for most of the week. Something I have never seen before for such a long period. Right now it appears it is still coming from NE. When it clears up we can still travel to Spectre on this wind direction, but if it’s still the same in a month when we head back up here, it totally scuppers our home bound strategy. No point in worrying too much about weather a month from now, especially when we’re currently pinned in a storm. So much for the stable high pressure and southerly winds which we were not only anticipating, but banking on. This unexpected wind direction is also throwing our sense of navigation. This far south it is quite confusing working out directions, magnetic North, true north, magnetic variation etc. and this peculiar wind direction further compounds the confusion. Thankfully our GPS devices have waypoints and tracks pre-programmed so as soon as we begin to travel we will quickly establish whether or not we are going in the right direction! 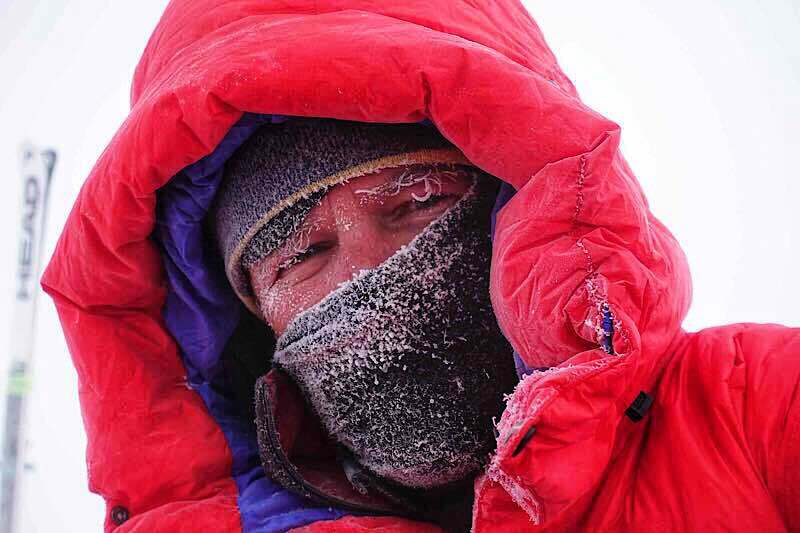 Must try to keep motivation up and stay on top of the situation so that when it clears up we are psyched and ready to go. It is possible we could be here for days! It’s snowing outside which is extremely rare here in what is officially classified as a desert. When the sun shines we have been told on good authority that it can be too warm to be inside a sleeping bag in the tent. That however is very much not the case in these conditions. It’s bloody freezing in here. Mark is being heroic, filming outside in the storm. Jean is measuring climatic conditions, though they both keep berating me that “this is not what it said in the brochure”. Just received a weather update. Going to get worse for a couple of days with winds up to 40knots, then looks like it’s clearing on Nov 24 and wind will swing around to a more normal southerly direction. Time for some R&R before we drop the hammer towards the Spectre in a few days. Please keep your comments coming, it’s really inspiring to know people are following our journey and keeps up the motivation for sending these updates and battling with our 3.5kbs data connection to send out photos! Leo, I presume you do not remember, but we met last year at the German Outdoor Fair in Friedrichshafen, together with Alex Txikon, Edurne Pasaban and some other great climbers. I am a mountaineering jornalist from Hungary. I am pretty excited about your trip since I’ve been badly in love with Antarctica for about 25 years! You are into probably the greatest adventure there is on Earth and I can’t wait to read your dispatches. Cheering for all of you to achieve your goals and to hear from you when you get back home! All the best to the whole team and keeping my fingers crossed for better weather. Stay cosy in that tent for a couple of days, slow and easy is ok.
Hi , at least you can get used to the temperature and wind etc before leaving , keep toasty Lad’s ! Your updates are interesting and inspiring. Your honesty, vulnerability and clear purpose are a lovely example of personal leadership. Thank you. Piggyride 2×2 and fire up some 7’s. Should be able to move forward in right direction with your weight by far! Safe travels, dude! You made it! Welcome to the Plateau. Better to be hanging in the middle of nowhere than back at Union Glacier. Anxious to hear what it’s like on the trail. It’s all down hill to the Gothics, right? What do you talk about while you are lounging around in that tent? Do you have a pack of cards? Good luck. Hope the storm passes and you can get moving soon. Sounds like my kinda holiday!! I asked the kids it they had any messages for you……..
“Hello Uncle Leo in the snow” Missy is very curious to know if you have built any good snowmen, or made any snow angels??! That is why you’ve gone to Antarctica after all, right??! Truly amazing guys! Keep strong and positive. The sun is out there permanently. Storms are temporarily. You knew this wouldn’t be a walk in the park and getting the worse right in the beginning will make you stronger. 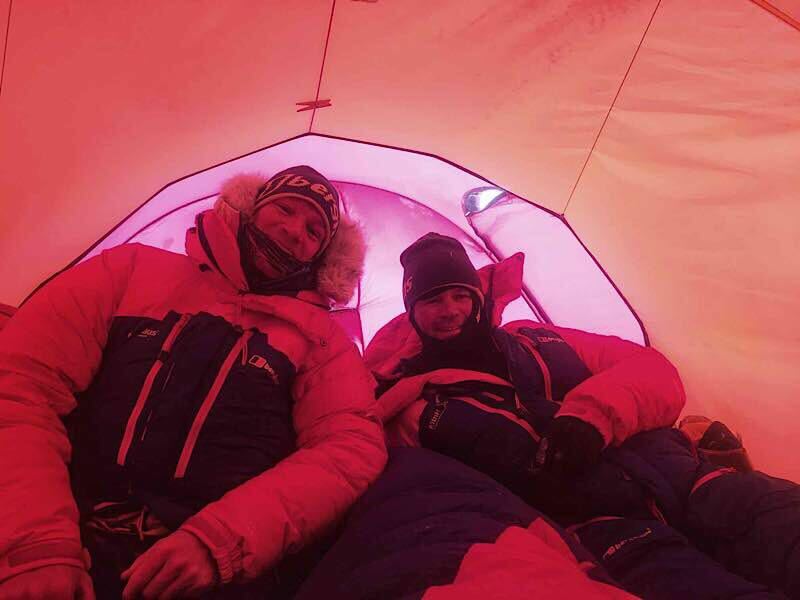 A few days in a storm in Antartica still better than stuck in a office, believe me! Loving the updates. Great writing, we feel like we’re there with you, (only 60 degrees C or so warmer). Enjoying the updates on your amazing adventure. Hope you get a good weather window soon, looking forward to more. Thought about you today when I was battling 26 degrees C on the climbs of Tenerife. Wishing you kind winds and swift travel very soon. Rooting for you guys! Something I hope to do someday. Type 2 fun woooo! On pense bien à vous. A l’occas, envoyez nous un peu de neige, ici c’est un peu la misère. Sinon, je vous souhaite le meilleur dès que possible.